Shisaku: Where Is The Real Abe Shinzo And What Have You Done With Him? 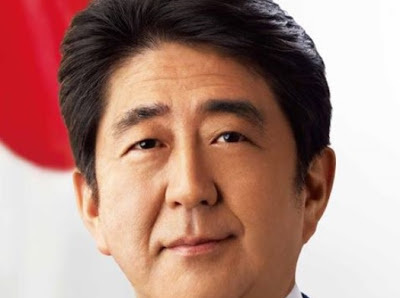 Where Is The Real Abe Shinzo And What Have You Done With Him? From the photo image on one of them, it seems that Prime Minister Abe Shinzo has a previous undisclosed identical twin brother, ten years his junior. The alternative explanation -- that the LDP's motto for this election, the same as it was in the last election, Nihon o, torimodosu ("Japan, I'm taking it back") is a prelude to the announcement of the Abe Cabinet's Fifth Arrow: time travel. And judging from the photograph, the fifth arrow is working rather better than the other four. All joking aside, Photoshop is for repairs, not makeovers. There is nothing wrong with being 58 years of age and looking like it. Taking Japan back to the Meiji era is more like it. I attended a good talk recently on the full scope of the constitutional change proposals, not just the headline "article 9" stuff. - in the previous photo Abe was looking towards a distant, higher point. not anymore in this pic; maybe he's keeping an eye (literally, see below) on the nikkei index. - actually if you split the image in two (try cover one half with a sheet) it seems that the left half is looking in the camera, while the right half is still looking upward (although not as high as in the previous poster, as far as I can remember). strabismus? First: the sheer arrogance of the big message "Japan started moving/functioning (orig. is ugokihajimeta)". As if Japanese history started last year. What is more revealing is, as often happens, in the fine print, that reads more or less, afair: We'll take back Japan, it's the responsibility of Tokyo. Here, the stress on the centralization of power, and on the role of the capital city, because of its natural and unavoidable vocation for taking the lead in the fate the country, reminds me of the Italian fascist propaganda, with all its bs about Rome and the Empire.